Google play store is the hub of android apps, from where you can get each and every types of apps for android smartphones. But sometimes android users feel very bad when they face "error" during downloading apps from Google Play store. According to the comments and reviews of android users, they generally face a Google Play error called "Error Processing Purchase DF-BPA-09". This error prevents users from downloading android apps from the play store. 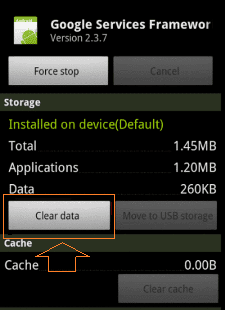 How to fix: “Error Processing Purchase DF-BPA-09"
Step (1): At first, open the “Settings” app on your android smartphone. Step (2): After that tap “Applications” option. Step (3): And then select the “All” tab. Step (4): Now, locate and tap “Google Services Framework“. Step (5): On the Google Services Framework page, tap “Clear data” and then tap "OK". That's it! From now, you will not face the Google play store error "Error Processing Purchase DF-BPA-09". Method #1: Clear the cache of Google play store app and its Services. Method #2: Remove your Google play store account and add again then try. Method #3: Flash the Google play store again and then sign in. 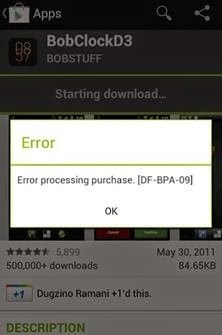 I hope, above mentioned information will help you to fix the Google Play issue “Error Processing Purchase DF-BPA-09". To get more updates related to android apps, android tips and tricks, step by step guide stay connected with us and check out our Android tutorials section.